Click here for the 2015-16 winter season! "Normal" values are seasonal averages based on the last seventeen winter seasons for Western Michigan University. 1. At least a trace of snow fell on 17 days in November. This is a record for the most number of November days with snowfall. The previous record was 15 days in November 2007. 2. A total of 8.8 inches of snow fell on November 18. This is a November daily snowfall record. The previous November record was 8.3 inches on November 20, 2000. 3. There were 0 days in December with a snow depth of a least 1 inch. This is a record for the least number of days with at least 1 inch of snow on the ground. The previous record was 9 days during December 1998 and again during December 2000. 4. Only 0.3 inches of snow fell in December. This is a record for the least snowiest December. The previous record was 4.2 inches in December 2011. These records are based on only 17 years of data. 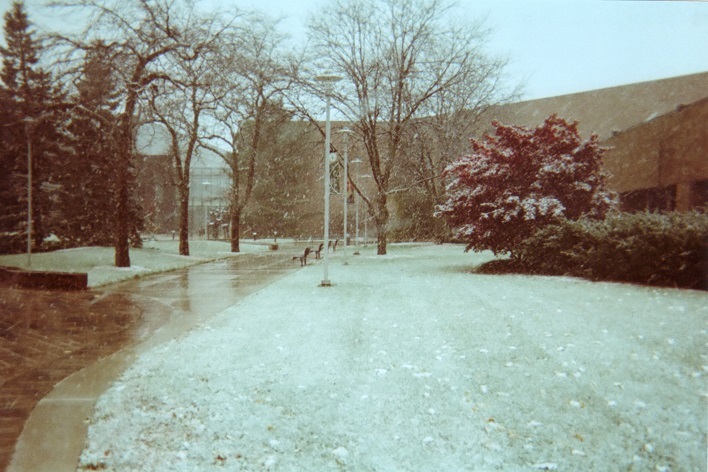 October 31, 2014 - The first snow of the season!